Despite a raft of recent changes to the 2011 All-Ireland champions squad, their goalkeeper is expected to stay on. ALAN BROGAN EXPECTS goalkeeper Stephen Cluxton to be involved in the Dublin squad next year despite speculation last week that he was set to walk away from the game. New Dublin manager Jim Gavin has already performed a significant overhaul of his squad with Ross McConnell, substitute goalkeeper Michael Savage, Paul Brogan (Alan’s brother) and Eamon Fennell all losing out. Defender Paul Casey and attacker Mossie Quinn have also announced their retirements recently but Cluxton is not expected to be amongst the names departing the capital setup. “Obviously, he is a very big part of the panel and he still has a lot to offer. I think he spoke to Jim and committed so I think it was a storm in a tea cup. Brogan admitted that the retirement of Quinn and Casey, two players who he lined out with in Dublin’s 2002 All-Ireland U21 final loss to Galway, has prompted him to pause and take stock of his own senior career. The St Oliver Plunkett’s-Eoghan Ruadh forward has committed to the Dublin cause for 2013 but will miss the opening stages of the season in a bid to shake off the injury that hampered his championship campaign this summer. That will include missing the O’Byrne Cup in January and potentially the early stages of Division 1 of the National Football League with Dublin facing Cork and Kerry in their opening two games. “I won’t be fit to start the year. It is osteitis pubis. I think it just takes time and if it doesn’t clear over time it may need an operation. But I haven’t decided to go down that route yet. It certainly will need two or three months. I won’t be playing in the O’Byrne Cup. “Every team comes to a stage where fellas leave or retire. The two lads, Mossie and Paul Casey, have given great service in fairness. Jim has made it clear that the panel is open-ended and the door will always be open, especially for guys who are talented as Eamon and Ross. Electric Ireland teamed up with Alan Brogan and Henry Shefflin yesterday to announce they have become the GAA’s Official Energy Partner until 2016. The partnership is an extension of the brand’s successful Cúl Green project. The brand currently sponsors the GAA All-Ireland minor championships. Email “Brogan backs Cluxton to feature for Dubs next season”. 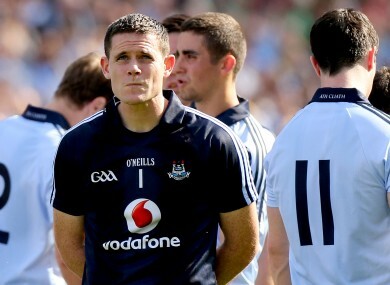 Feedback on “Brogan backs Cluxton to feature for Dubs next season”.